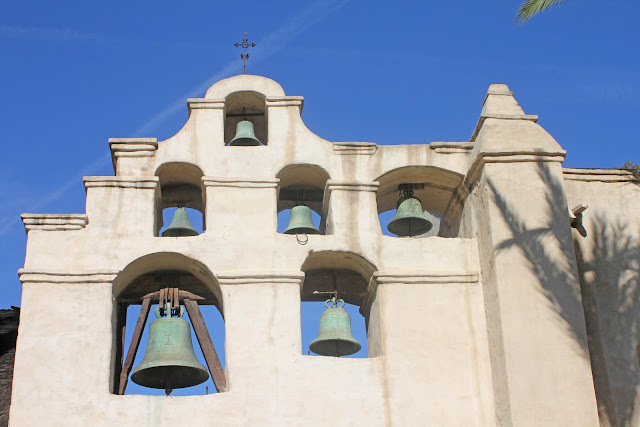 Gil and I made a day trip out to the San Gabriel Mission on Thursday. San Gabriel is less than 10 miles from downtown LA and very familiar turf for me, as I used to live in the San Gabriel Valley (Montebello) circa 1985-1987. I was living with my Aunt Sheri at the time (she is mom's youngest sister and only 4 years older than me, so to me she's not "Aunt" but just "Sheri"). On October 1st, 1987, the Whittier Narrows quake (5.9 on the Richter) struck, severely damaging the mission and also scaring the bejeezus out of us. I remember it was probably around 7:45 am on that fateful day and I was still fast asleep when out of the blue it felt as if the Furies had picked up the end of the bed and started shaking it out like a rug. Anyhoo, a few months later, Sheri and I ventured out to visit the Mission, only to find out that it was closed indefinitely for repairs and retrofitting. Now, a couple decades later, here I am, finally getting a look-see at a remarkable historical place that used to be so close to home. 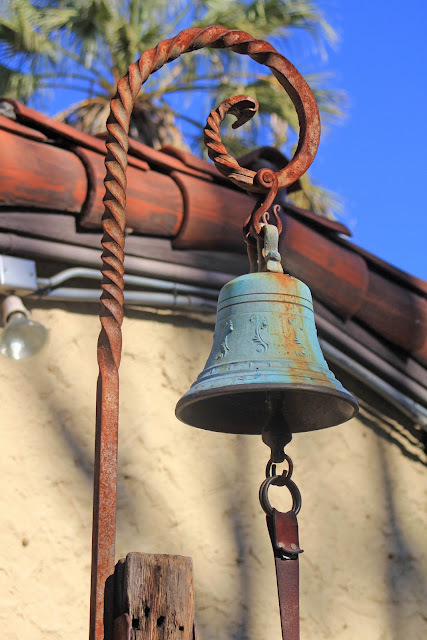 12/2/10 The campanario, or bell tower. El Camino Real Door - the original entrance to the Mission. The San Gabriel Mission (the 4th of 21 missions) was founded by Father Junipero Serra on September 8, 1771, and its the architecture that sets it apart from all the other missions. Father Antonio Cruzado, born and raised in Cordova, Spain, designed the structure. 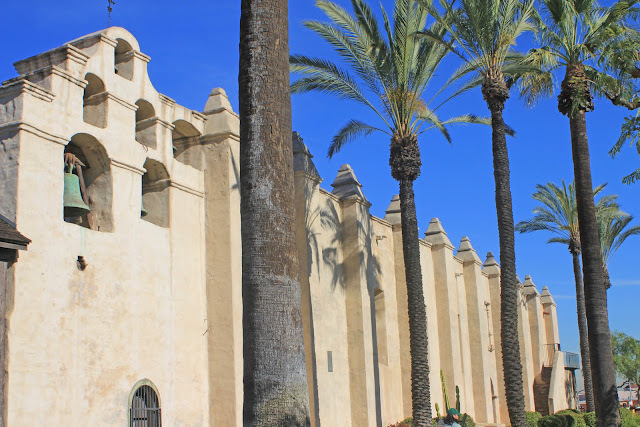 The Moorish influences are seen in the capped buttresses, vaulted roof and ceiling, narrow windows, and the fortress-like look of the church. Ruins of the original bell tower. Named for the Archangel Gabriel, the San Gabriel Mission was also nicknamed the 'Queen of Missions.' 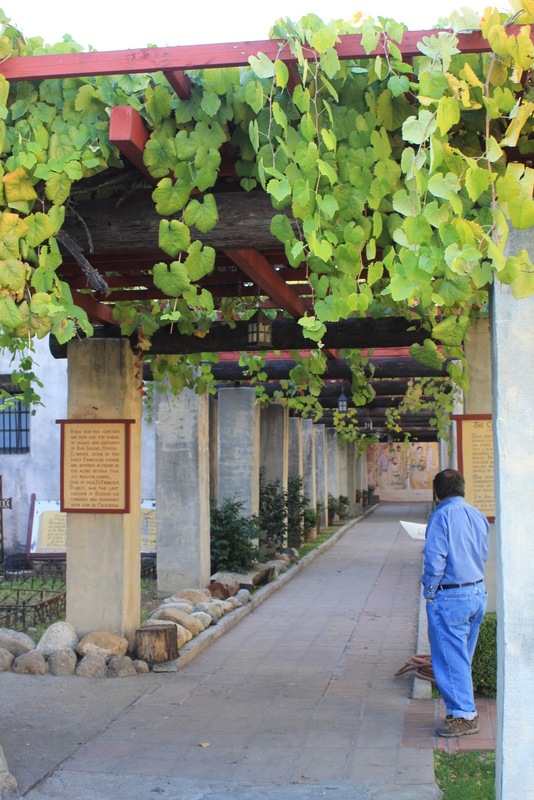 It was prosperous during its heyday and an important cultural and spiritual center. 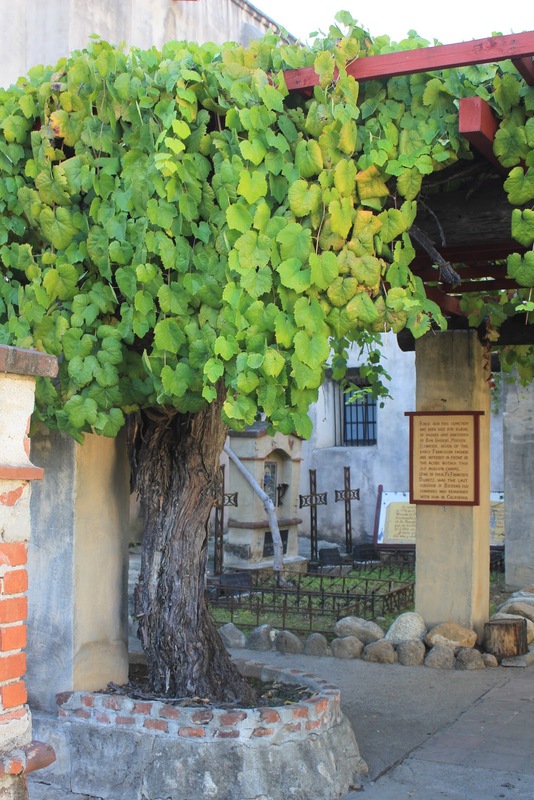 Grapevine planted in 1925. 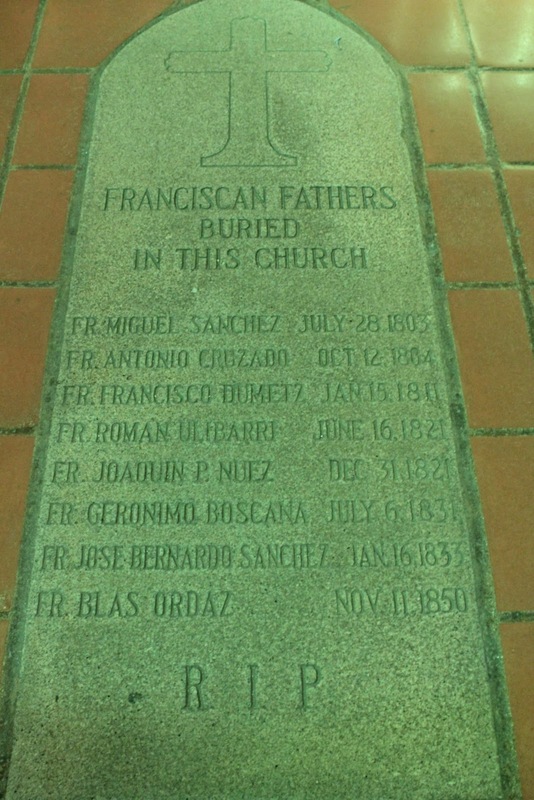 Campo Santo Cemetery. Campo Santo Cemetery. Oldest cemetery in LA County (first consecrated in 1778). 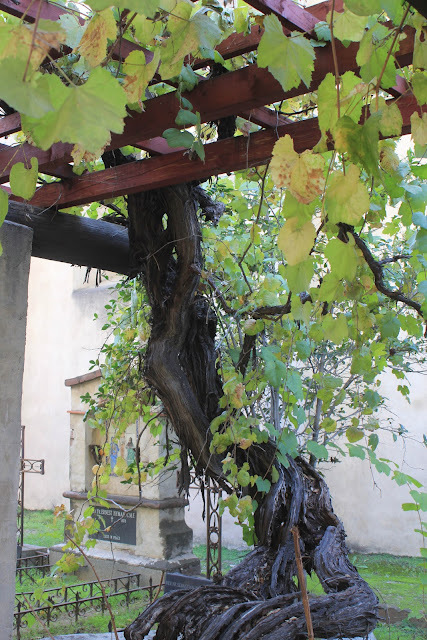 Another old grape vine. 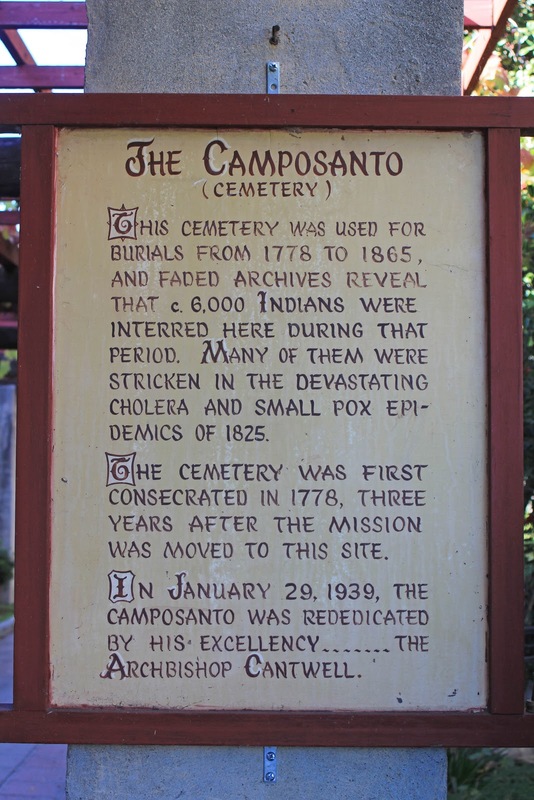 Camp Santo cemetery. 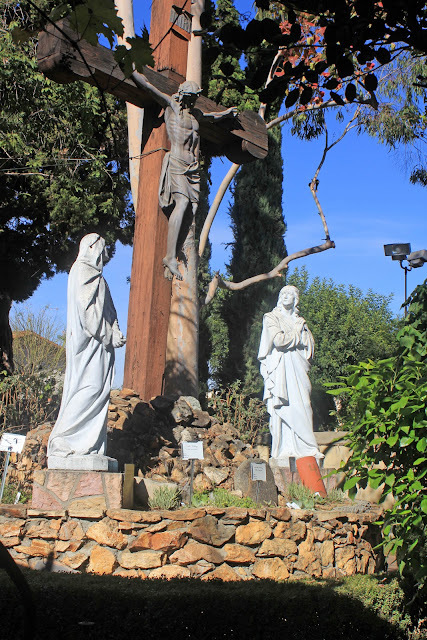 This crucifix in the Campo Santo Cemetery is a memorial to the 6,000 Gabrielino (Tongva) band of mission Indians buried here. I believe this is a Chinese Tallow tree (Sapium sebiferum), in fall colors. Campo Santo Cemetery. 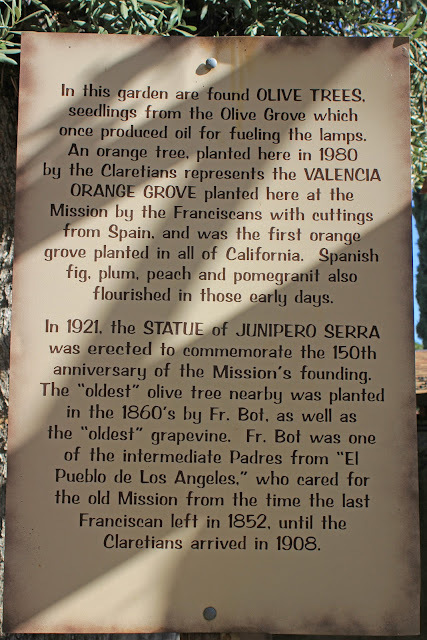 The two oldest olive trees at the mission were planted in 1860. Statue of Father Serra surrounded by the oldest olive tree and the oldest 'Mother' grape vine. 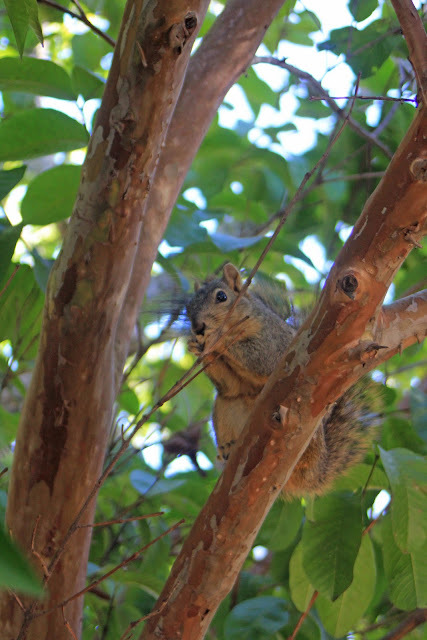 A very busy squirrel in the Quadrangle. Museum. Quoting the mission brochure: "Museum building was constructed in 1812 of adobe brick with a tiled roof and was almost 300 feet long." 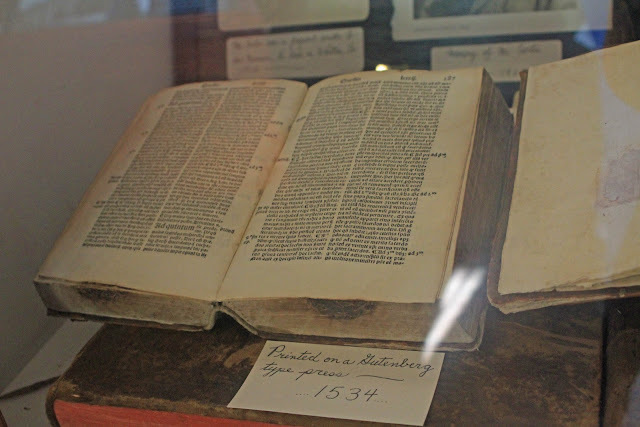 Book printed on a Gutenberg type press, 1534. 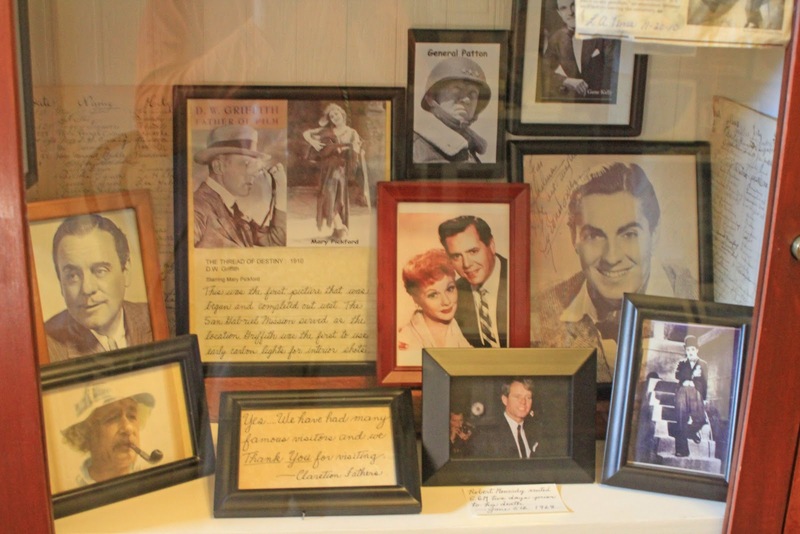 Some famous folks have visited the mission. 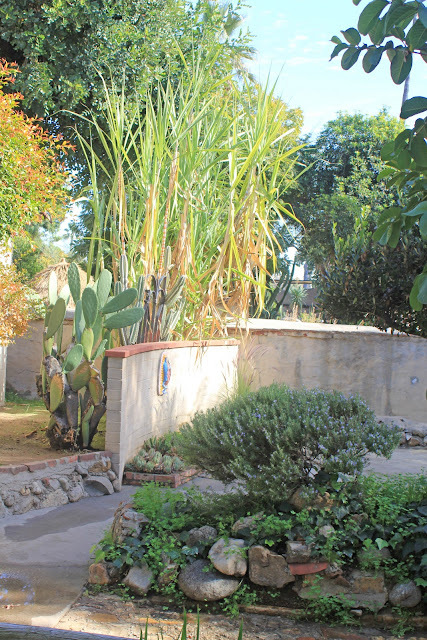 "The planned site for the Mission was along the banks of the Río de los Temblores (the River of the Earthquakes—the Santa Ana River). However, the priests chose an alternate site on a fertile plain located directly alongside the Rio Hondo in the Whittier Narrows. 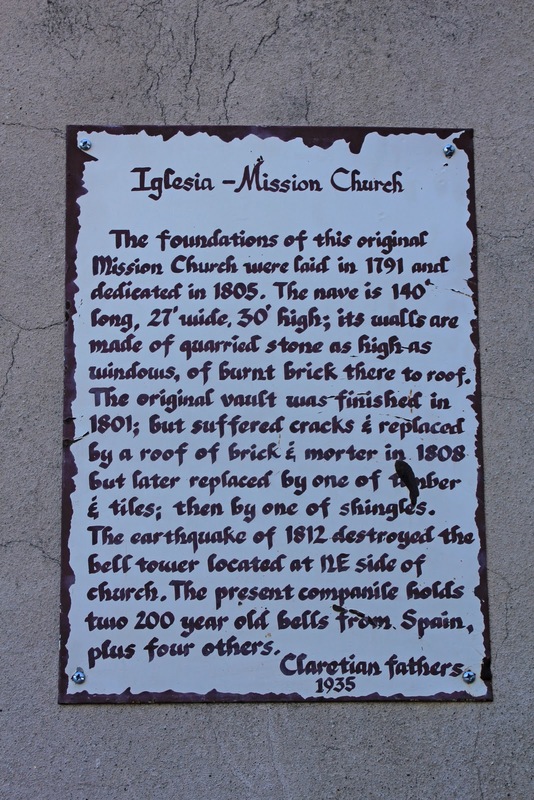 The site of the Misión Vieja (or "Old Mission") is located near the intersection of San Gabriel Boulevard and Lincoln Avenue in Montebello, California (known to the natives as Shevaanga). 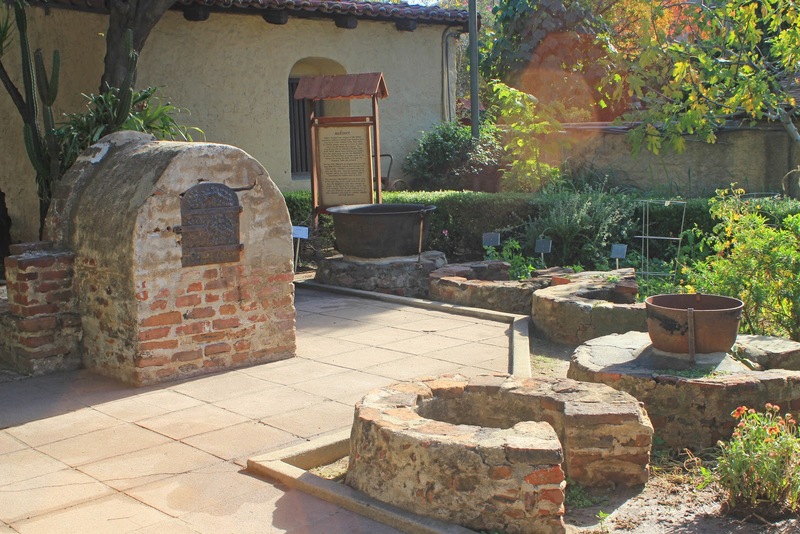 In 1776, a flash flood destroyed much of the crops and ruined the Mission complex, which was subsequently relocated five miles closer to the mountains in present-day San Gabriel (the native settlement of 'Iisanchanga)...Well over 25,000 baptisms were conducted at San Gabriel between 1771 and 1834, making it the most prolific in the mission chain. In its heyday it furnished food and supplies to settlements and other missions throughout California. 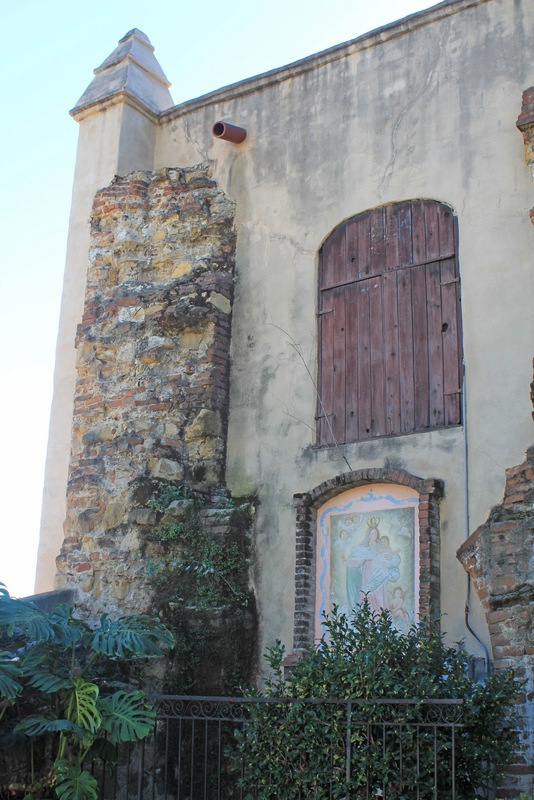 A majority of the Mission structures fell into ruins after it was secularized in November 1834. The once-extensive vineyards were falling to decay, with fences broken down and animals roaming freely through it. 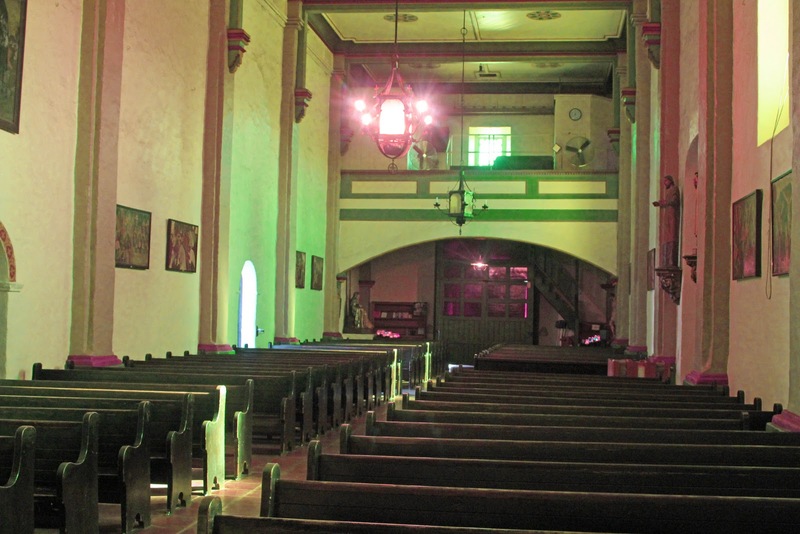 The Mission's chapel functioned as a parish church for the City of San Gabriel from 1862 until 1908, when the Claretian Missionary Fathers came to San Gabriel and began the job of rebuilding and restoring the Mission. 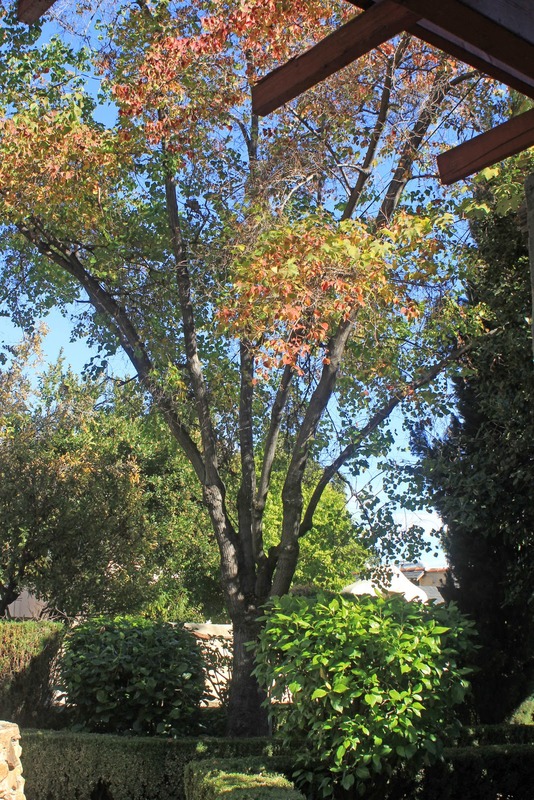 On October 1, 1987 the Whittier Narrows Earthquake further damaged the property. 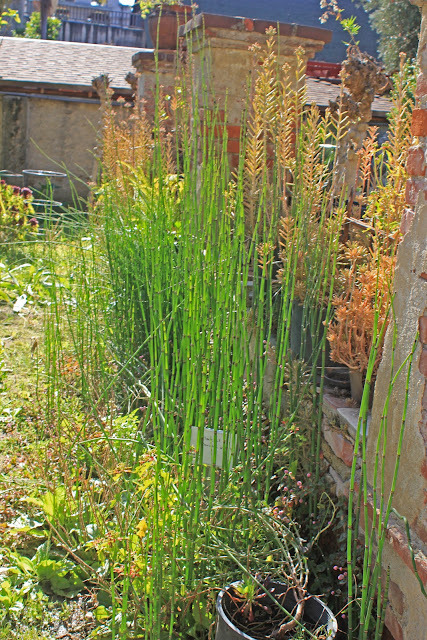 A significant portion of the original complex has since been restored." Assorted cacti, succulents and California natives. 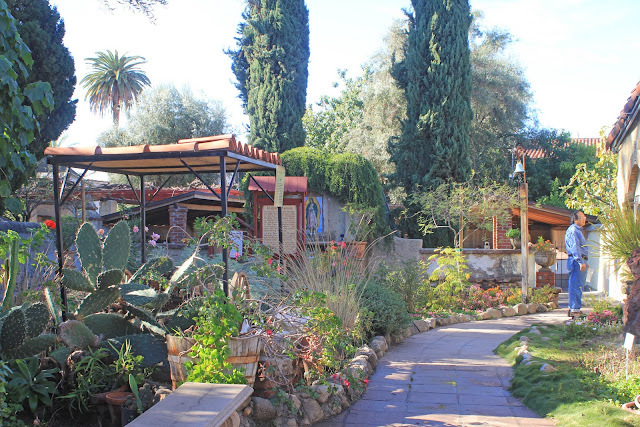 Peace Garden, with a hand-made tile of Our Lady of Guadalupe. 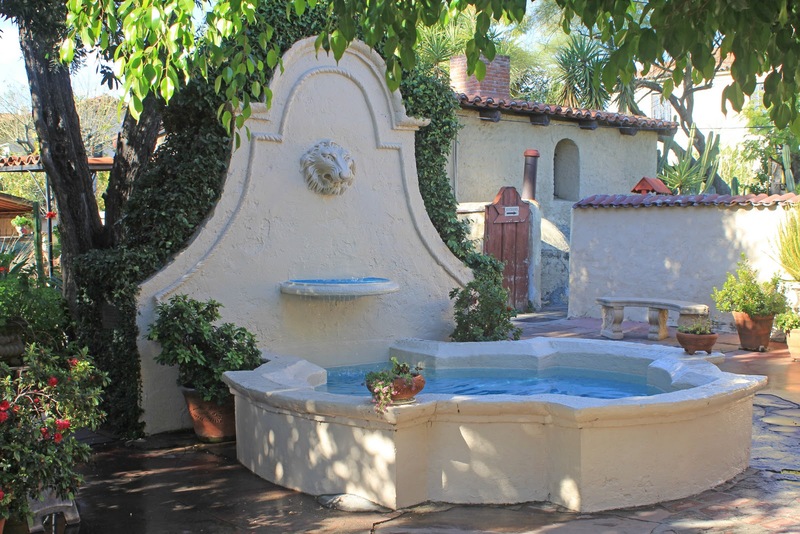 Fountain Plaza (fountain made in the 1940s by Native Sons and Daughters of the Golden West). 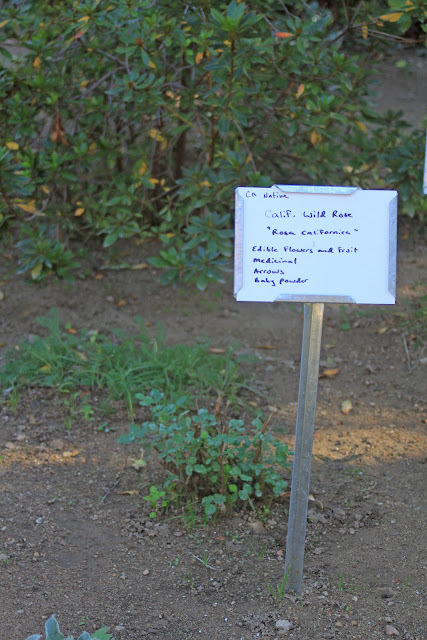 There are quite a few natives being cultivated on the mission grounds, most of them quite small, so probably newly planted. Hours & Admission: Church, museum, grounds and gift shop open 9am to 4pm except on New Year's Day, Easter Sunday, July 4th, Thanksgiving Day, and Christmas Day (open 9am to noon on Christmas Eve). Admission is $5 for adults, $3 for ages 6-17, $4 for seniors (62 and older) and free for children 5 and under. San Gabriel Mission is the 4th out of 21 California Missions. 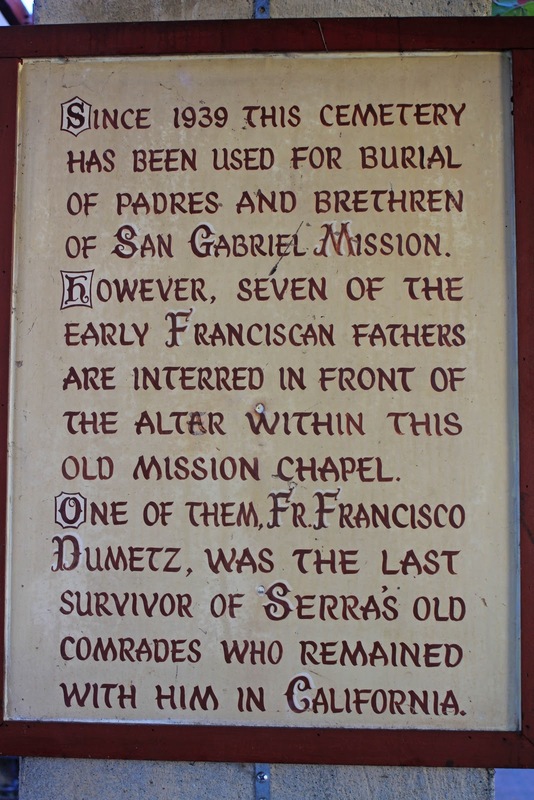 Special Designation: "Pride of the Missions"
Founding Father: The Blessed Junipero Serra, first Father President of the California missions. Prominent Missionaries: Between 1775 and for the next 28 years, Fathers Antonio Cruzado and Miguel Sanchez worked together to make this one of the most successful missions in California. Fr. 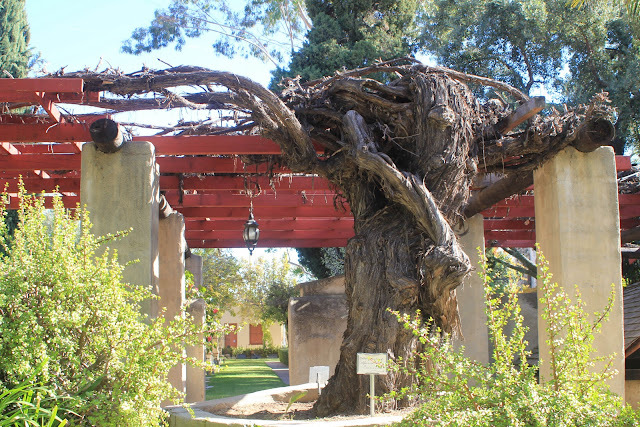 Jose Zalvidea continued their work for another 20 years, and is credited with introducing large-scale viticulture to California. 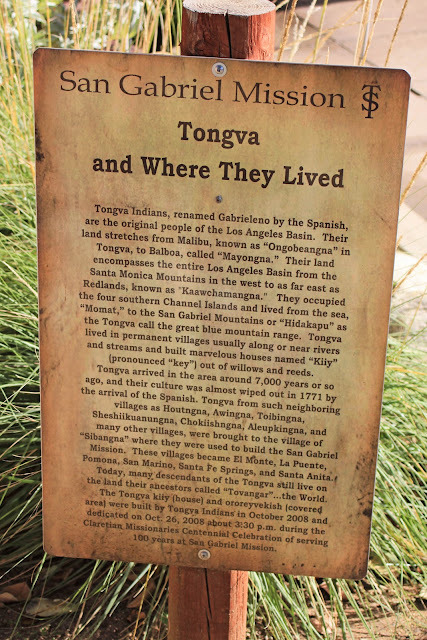 Indians Joining this Mission: In the mission era these natives, who spoke one of the Cupan or Cupeno languages of the Takic family, were called Gabrielino after the mission. Known now as the Tongva, the descendants were recognized as a distinct tribe by the State of California in 1994. They have sought Federal recognition for decades. 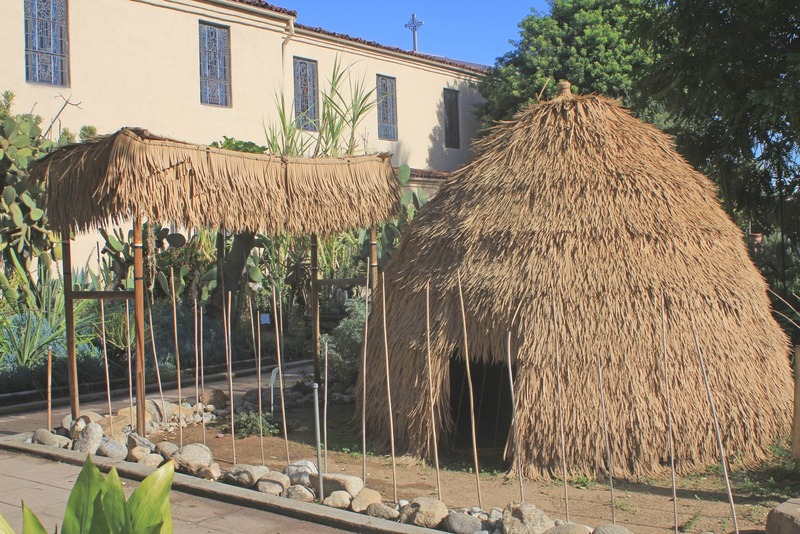 Mission Site: The mission was originally established along the slopes of the Montebello hills at the native site of Shevaanga, overlooking the San Gabriel Valley. 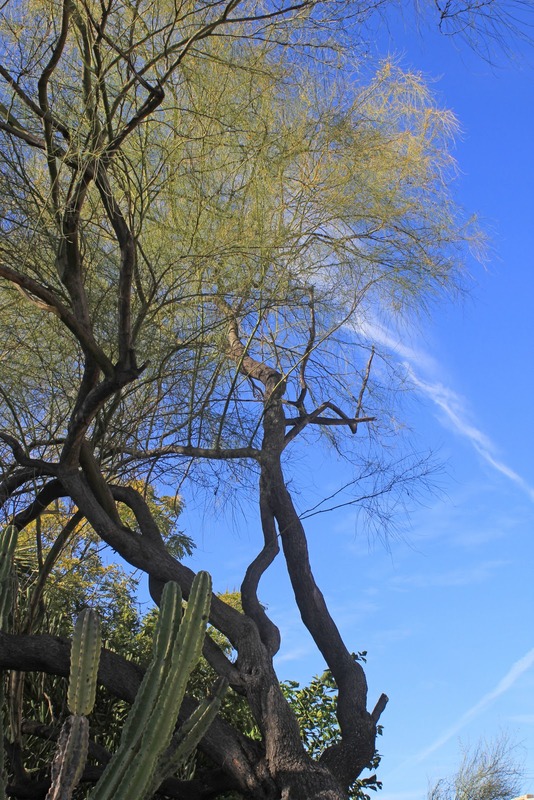 In 1775 the mission was relocated to the native site of Iisanchanga "about a league" (3 miles) to the northwest. This mission is 9 miles east of downtown Los Angeles. Layout: Traditional quadrangle, with soldier's barracks, neophyte housing, warehouses, and other structures (forming a second incomplete quadrangle) extending out from the central compound. Water Source: The Rio Hondo and several springs fed an aqueduct, reservoirs, and a canal system that provided abundant water to the mission and its extensive vineyards, orchards, gardens and mills. 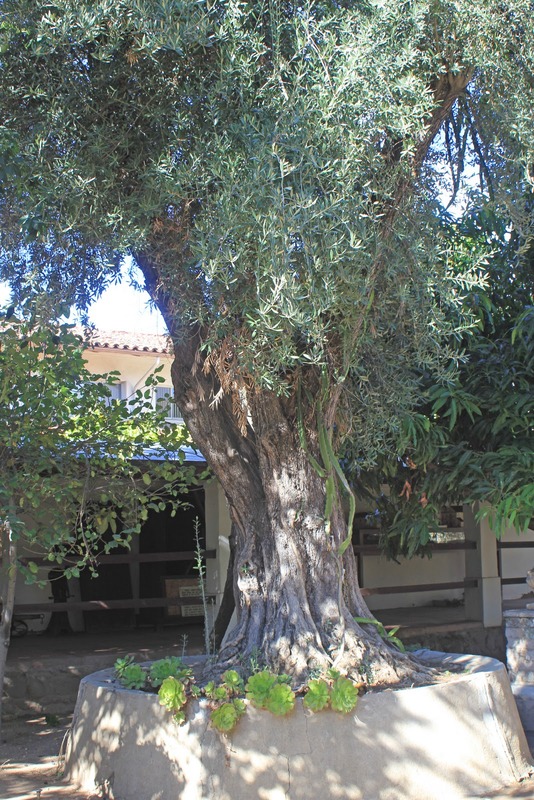 Population: Within 15 years of its founding, San Gabriel had 1,000 neophytes. The highest population recorded was 1,701, in 1817. Livestock: Starting with only 128 animals in 1772, the mission herd reached 42,350, primarily cattle (25,000) and sheep (15,000) at its peak in 1829. 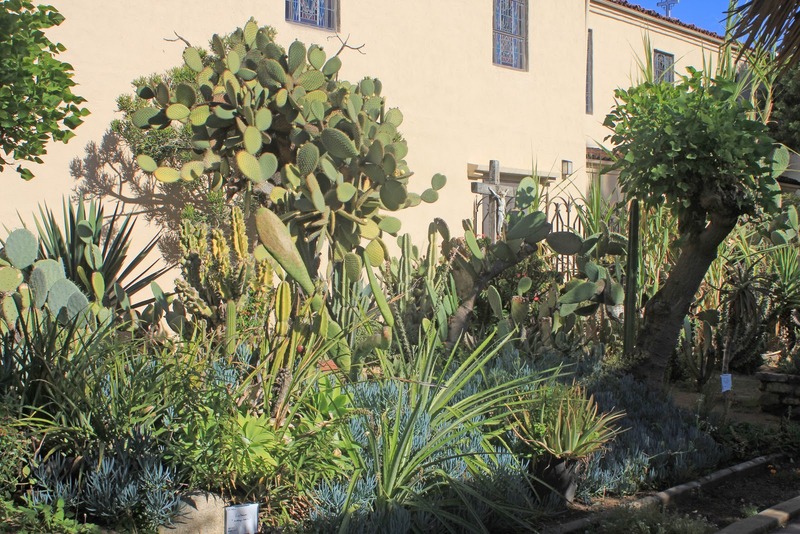 Agricultural Output: Over its active life San Gabriel was far more productive than any other mission in California, harvesting over 353,000 bushels of wheat, barley, corn, beans, peas, lentils and garbanzos. Mission Church: The unique San Gabriel church, completed in 1805, features a Moorish, "fortress-lik" appearance, with capped buttresses and long narrow windows along the prominent side wall. The style is similar to the Cathedral in Cordova Spain. Mission Bells: Six bells occupy an espadana or bell wall. THe oldest bells were cast in Mexico City in 1795 by the famous bell maker, Paul Ruelas. 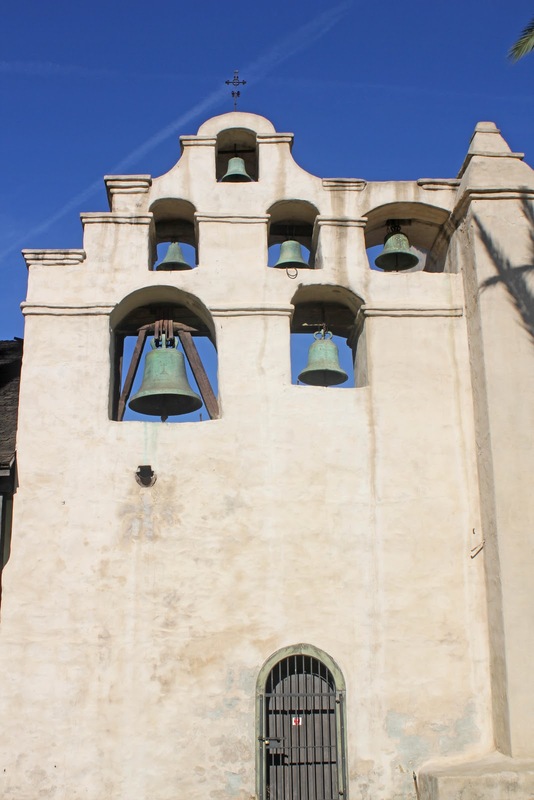 The largest bell (dated 1830) weighs over a ton and was used for over a century to ring the Angelus, a prayer said at morning, noon, and evening in commemoration of the Incarnation. 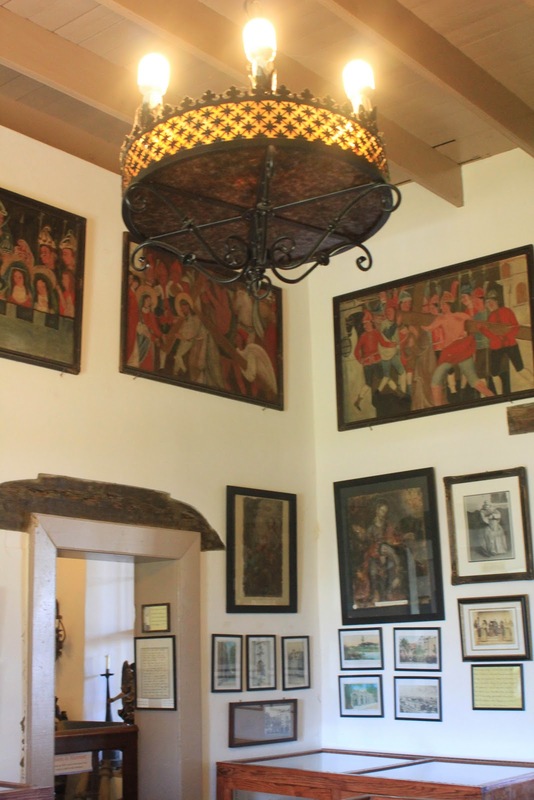 Mission Art: The Stations of the Cross are said to be authentic neophyte Indian paintings. 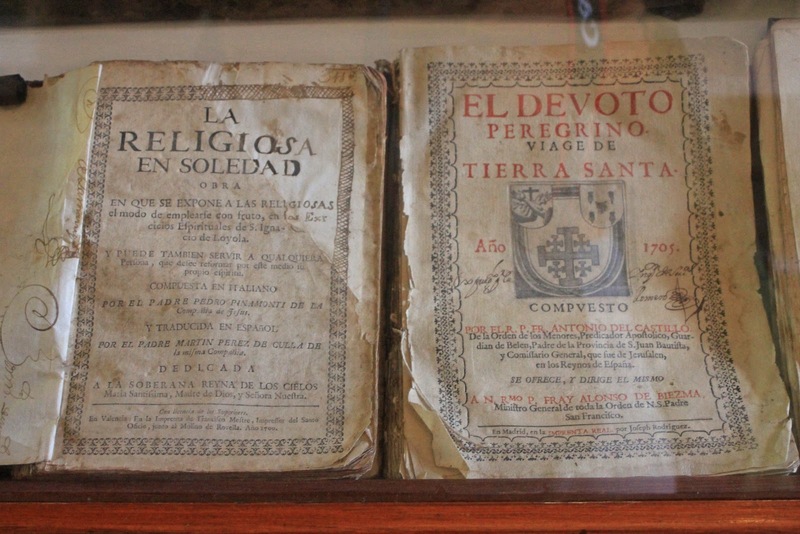 They were exhibited at the 1893 World's Columbia Expedition in commemoration of the 400th anniversary of the discovery of the New World. 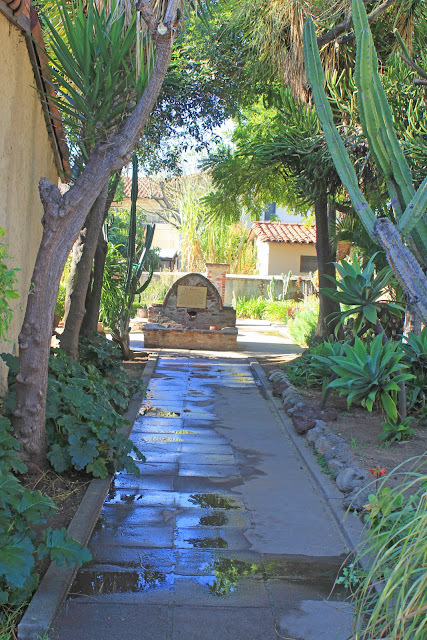 Significant Events: In 1846, what remained of the mission estate was granted to a Messieurs Reid and Workman on the condition that they pay all remaining claims to the mission creditors and support the mission's padres without obstructing community access to the church. The title granted to Reid and Workman was deemed invalid by the U.S. Land Commission in 1855, and the property returned to the CHurch in 1859. Year Returned to Catholic Church: 1859 (decree signed by President James Buchanan). 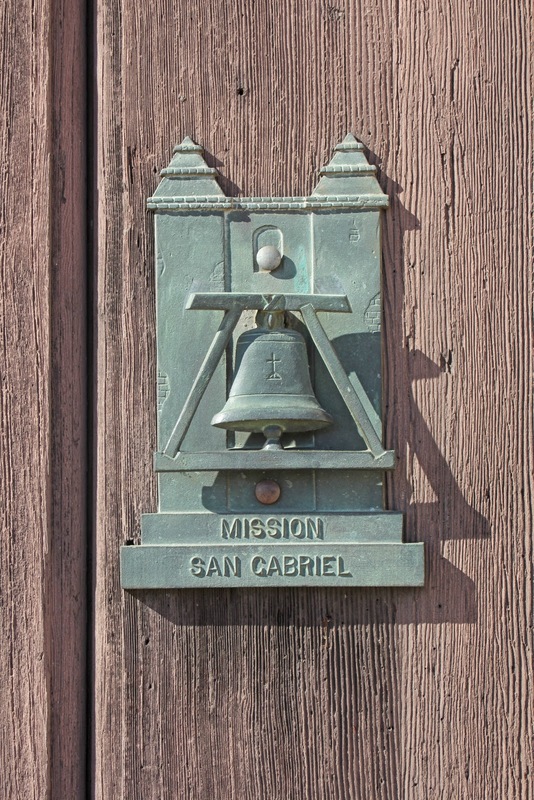 Responsibility: Claretian Missionaries have been responsible for San Gabriel since 1908. Interesting Facts: The main entrance to the church is quite plain. 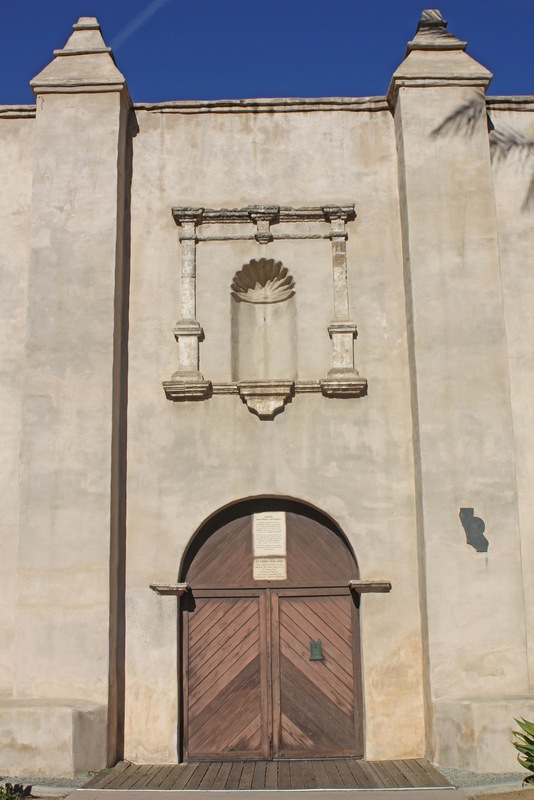 In the mission era the prominent door in the side wall of the church opened directly onto El Camino Real ("Royal Road") connecting the missions, pueblos and presidios. San Gabriel was located astride three prominent trails, Settlers, military expeditions, and travelers frequently stayed at the mission, which had turbulent relations with the Native Americans because of the large military presence. 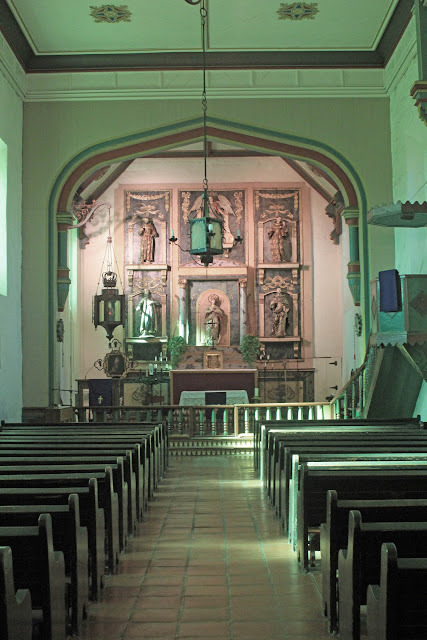 Missionaries from San Gabriel guided the development of the Church of our Lady of the ANgels at the pueblo (town) of Nuestra Senora la Reina de los Angeles, founded in 1781. Great pictures and information too!